Introduction: a robust but limited research interface? 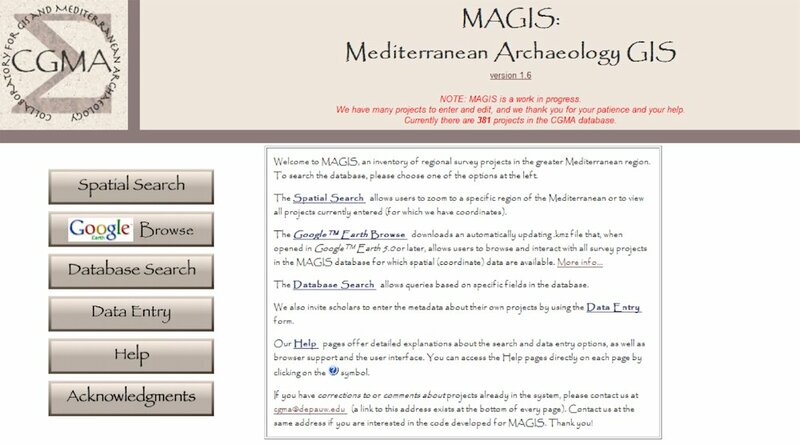 "MAGIS (pronounced may-jis) is an acronym for Mediterranean Archaeology GIS. MAGIS is an on-line inventory of regional survey projects in the greater Mediterranean. Archaeologists, historians and other scholars of the ancient Mediterranean can search or browse for surveys, access detailed information and bibliography about them, and map their distribution. Note that MAGIS contains survey metadata (information about the projects), not actual survey data" (http://cgma.depauw.edu/MAGIS/Help/help.php). Bearing this in mind, it seems that the database, while providing a useful research tool, has some limitations. A metadata search for survey methods of a particular type, or projects focusing on a particular period is fine, although details of projects and a summary of their results are beyond the scope of the website. With such a simple premise, the strength of MAGIS is the simple front-end and robust database functions that it employs. The database allows the user to search by geographical area using a map interface, or by database search using keywords and other search terms. In addition the user can download a kmz file of the project areas for uploading into GoogleEarth (see Figure 1). Figure 1. The MAGIS website homepage. The spatial search operates in a similar way to many of the database resources located online for archaeological, historical and geological research (the Archaeology Data Service's ArchSearch page, and the United States Geological Survey global visualization viewer pages come to mind, as well as other sites), and the project areas are represented as polygons with red borders. Different topographic layers can be turned on and off, and a simple zoom and area selection function is also available. Once a project area or areas have been selected the database retrieves the relevant entries. The basic level of the map query is beneficial in terms of accessibility of the site, conforming to the notion that all researchers should be able to access and interrogate the database using the map function regardless of the type and age of their computer. It would be difficult, however, to make the case that this represents an advanced or cutting-edge GIS interface, with research limited to the selection of projects by area. The rationale behind this form of research interface also seems to be compromised by the fact that not all projects are represented in the spatial search, as some survey metadata does not contain any spatial information. This is perhaps a by-product of the onus for project data entry being placed on individual research project PIs (see below). Some stipulation for mandatory spatial information would allow all projects to be represented on the map interface. In addition some spatial searches bring up project data for areas not represented within the search area (see Figure 2), with a search in central Italy retrieving a project for preliminary survey work in East Arabia. Figure 2. Search return from the spatial search window for project polygons in central Italy. The GoogleEarth kmz download makes the spatial search for different project areas much smoother in a more familiar package. The kmz file contains the project polygons represented on the map interface of the MAGIS website, allowing the user to review the areas in GoogleEarth and, by selecting a polygon, GoogleEarth links to the MAGIS webpage and lists the project description and link to the database. For researchers the most useful interface for MAGIS is, however, the database search. Once again a simple interface, allowing the user to search by keywords for all fields or by fields such as project ID, location, country or ancient location, is presented to the user, allowing basic search terms to be used. In addition projects can be browsed by zone or country, and a number of sample projects are listed below the search box. In general the search function works well, with simple keywords facilitating a search of projects and retrieving a representative series of entries. As a result of a search, a series of projects will be retrieved in a basic table view, with each entry linking through to the project data page. The premise of MAGIS is that only metadata for different projects is represented in the database, and as such all project searches provide extensive metadata, including project titles and descriptions, geographical location, principal investigator details and topographic information. 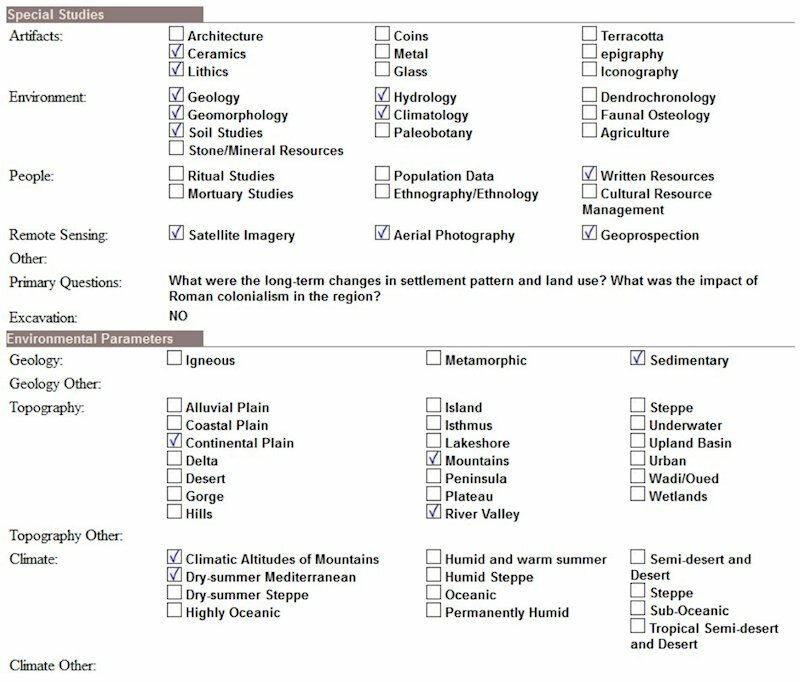 In addition, chronological coverage and methodological descriptions are given in the form of tick-box descriptors for fieldwork and specialist studies (artefact, environmental and remote sensing for instance). Environmental parameters are also specified, together with a basic bibliography of references relating to the project (see Figure 3). Figure 3. Methodological and environmental parameters for a sample project. The metadata presented for each project is extensive, and the use of a basic tick-box system means they conform well to a set of established search terms. However, the limitations of the database become fairly apparent here. The metadata, the basis for searches run by the user for providing a list of projects compatible with their areas of interest, is not of great use when presented as a list of parameters. The specialist lists are perhaps of some use to those wishing to assess which methods have been used on a project, but other parameters, such as geology and topography, are more in keeping with a set of search terms than anything else. As the site focuses almost exclusively on metadata, no incisive information is really given on the nature or results of each project, beyond a cursory project description at the top of each project page. Any further data retrieval is left to the researcher through the listed project website link, and through the bibliographical section. In providing a large entry for metadata relating to each project, the site has a number of failings. While the basic project descriptions, principal investigators and website links are generally intact, many of the fields within each entry are empty or, at best, contain minimal input. The chronological coverage section of each project is a case in point, with basic periods generally specified, but with chronological ranges generally left out. This is probably a result of varying chronological parameters being used by different projects, but if the aim of the website is to produce a database of comprehensive metadata for all projects then these lacunae in data archiving weaken the claims of the site. The geographical location sections of projects also seem to have minimal data entry, linking to the issue of spatial search function (see above), a problem that could perhaps be overcome by ensuring mandatory data input for project entries. Data entry for the descriptive and bibliographical sections of the database are generally comprehensive and clear, although a number of spelling mistakes were noted in the database (the Sangro Valley project for instance is associated with Brasenose College Oxcord, rather than Oxford). The MAGIS database and GIS provides a comprehensive resource for online research into projects in the Mediterranean, and represents a substantial 'work in progress' underlining the efforts of staff and students at DePauw to establish a useful research tool. Collating and synthesising information on projects from across the Mediterranean indeed represents a labour of love. Bearing in mind the general aims of MAGIS, this should not have been problematic, but many of the drawbacks precisely stem from the rather general aims of the site. The scope of MAGIS is to provide a resource for scholars of the ancient Mediterranean, and as such the site contains data for projects in the 'greater Mediterranean region', a geographical cover-all which means that project metadata is included for areas as far-flung as Portugal, Arabia and the Baltic coast of Germany, as well as the Black Sea and Central Europe. From an academic perspective, and considering the research interests of many of the scholars who have worked in the Mediterranean, this may be no bad thing, but for this site a deeper, more searching synthesis of material within a more constrained geographical area would be preferable. In terms of its technical and data components, MAGIS’s basic interfacing and data search functions are excellent for this level of data interrogation, making no false claims as to the nature of the site. Some correction of entries and checking for errors in data entry would be useful, and perhaps a more rigorous programme of data entry, including mandatory fields for location and chronological information would also be beneficial. One of the drawbacks is that data entry seems ultimately to be the responsibility of the principal investigators of different projects, and hence the resource will only be as good as the threshold for user-based data input will allow. MAGIS is relevant to current research in Mediterranean archaeology, and its strength ultimately lies in the excellent search terms associated with survey methodologies and specialist activities. These strict and exacting research criteria go beyond many of the other databases available for archaeological research on the web, and perhaps more could be made of them. The real limitation of MAGIS is that once a search has been completed and the metadata read, the researcher is back to the normal foot-slogging of website investigation and library work. A crucial improvement to the site could be linking to summary online report documentation (this brings to mind the useful Fasti Online database with its FOLD&R online documents and research section including, for instance, documents for Italy) allowing project directors or MAGIS technicians to deposit field reports and summaries onto MAGIS.